The Goloka Seva Trust promotes and maintains the valuable art of incense making, using purely natural ingredients. The trust also conducts in-house research to develop varieties of non-toxic user-friendly incense and related products. 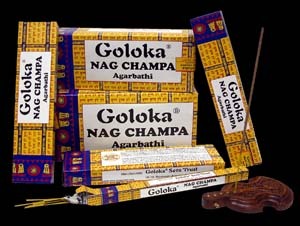 Goloka Nag Champa maintains the valuable art of incense making known as Agarbatti Hand rolled and crafted in India using only naturally grow organics in a clean, sterile, healthy environment Goloka Nag Champa packaging is made from recycled materials and the incense is wrapped in wax paper, free of plastic and any other unnatural materials. No animal by-products are used in Goloka Nag Champa's creation. We offer this product in sizes: 16g, 40g, 100g, and 250g. Approx 1g = 1 stick of incense. With the recent changes in Satya Sai Baba Nag Champa, we consider Shanthimalai "Red" Nag Champa, Mother's Fragrance and Goloka "Gold" Nag Champa to be the best value and quality Nag Champa incenses in the world..